In 1988 Clem Clement was looking to buy a Model A Ford when he came across a 1929 Packard Standard Eight Touring Car at auction. The handsome seven-passenger car was on the auction block and Clement was invited to place a bid. He knew a vehicle like the Packard was undoubtedly beyond his means, so he placed a ridiculously low bid on the car and went home. Within a couple of weeks he had located and purchased a nice Model A Ford. Then the telephone call came informing Clement that his was the high bid on the Packard. He did the honorable thing and bought it. He wasn’t even certain of how to start the 320-cubic-inch, inline eight-cylinder engine. He began collecting literature and manuals about the Packard, asking questions of other Packard owners and joined a couple of Packard clubs. “I tightened every nut and bolt on the car,” Clement says. He marked each one with chalk to make sure he didn’t miss one. Among other chores, he installed a new head gasket and replaced the starter switch. “I have done repairs throughout the car,” he says. After more than a year of bringing the Packard up to roadworthy standards Clement titled his car in September 1990 and cautiously put it on the road. The 90-horsepower engine is smooth and powerful, easily propelling the 3,905-pound car. “She’s not a night car.” The rear of the car has a three-light combination on the left rear fender that houses the white lens backup light, the red lens taillight and the red lens brake light. Each wheel has a dozen wooden spokes and is wrapped by a 7.00×20-inch tire. The two spare tires nestle in the front fender wells. Between the right side-mounted spare tire and the engine hood is a compartment holding the 6-volt battery. Packard designers and engineers were seemingly obsessed with heat and fresh air. Each side of the engine hood is ventilated by 28 vertical louvers. In front of the radiator are 16 thermostatically controlled louvers to keep the 5 gallons of coolant from getting too hot. Clement now feels confident when he settles into the driver seat behind the four-spoke steering wheel. The lever to the left of the horn button operates the headlights while the one on the right is the throttle. 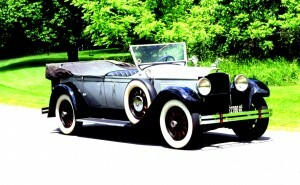 Riding on its 133.5-inch wheelbase, the 16-foot, 4-inch-long Packard has a 23-foot, 6-inch turning radius. A single wiper keeps the windshield clear for the driver and to help him find his way after dark. A spotlight was standard equipment. A number of features on the car were common three-quarters of a century ago, but recently caught Clement’s attention. The handbrake sprouts from the floor by the driver’s left knee. On the floor beside the accelerator is a footrest with three separate steps. Three of the doors have inside door handles, but the driver is required to reach outside and use the exterior door handle to open his door. All four doors, however, have storage pockets in the black leather upholstery. A single courtesy light illuminates the right rear passenger area. The Packard’s gray body is in sharp contrast to the black fenders with the white pinstripes. This entry was posted in Classic Cars of 1920s and earlier, Let's Restore this Old Car -- Classic Classics. Bookmark the permalink.